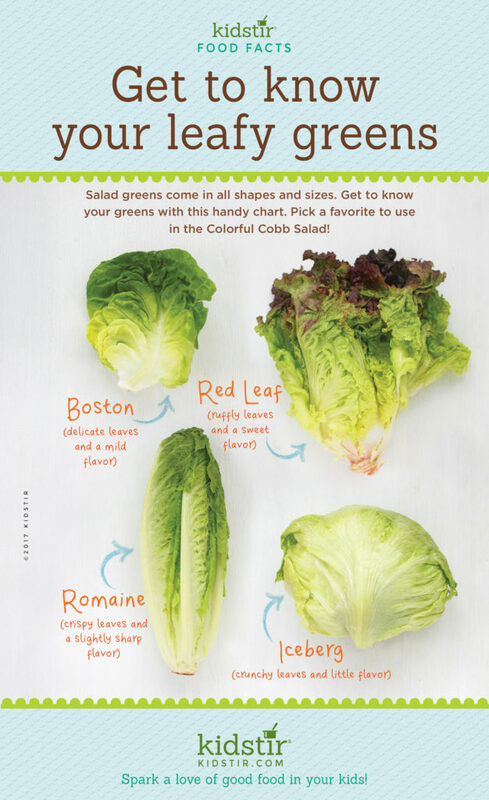 Salad Greens come in all shapes and sizes. Get to know your greens with this handy chart. Pick a Favorite to use in the Colorful Cobb Salad! There are lots of uses for leafy green veggies, the easiest way to get kids to love veggies is in tossed salads. Here are a few salad ideas to help your kids to grow to love salads – start by turning them into salad chefs. Get kids to eat their greens by growing a pick and eat garden. Lettuce, spinach, tomatoes, peppers, and other salad essentials are easy to grow from starter plants from your local farmer’s market or garden center. Try a new veggie or dressing or combination of toppings on their lettuce. At home, you can then create a mini salad bar with bowls of toppings. Think greens (lettuce, spinach, arugula) and dressings. Then let kids customize their salad. Send a little salad to school with kids! You can serve salad on a stick. Little lettuce bites, cherry tomatoes, cucumbers, and other veggies on a skewer or toothpick. Add one of our Crunchy Croutons on the end. Pack a small container of dressing for dipping! Mixing salad dressings is wonderfuly fun kitchen activity for kids. You can follow our recipe for Poppy Seed Dressing or the dressings in the Sunny Salads kit. Or, invent your own. How about another leafy green – Spinach! One of the great things about salads is the quick preparation. This great spinach salad can be prepared in just 15 minutes! 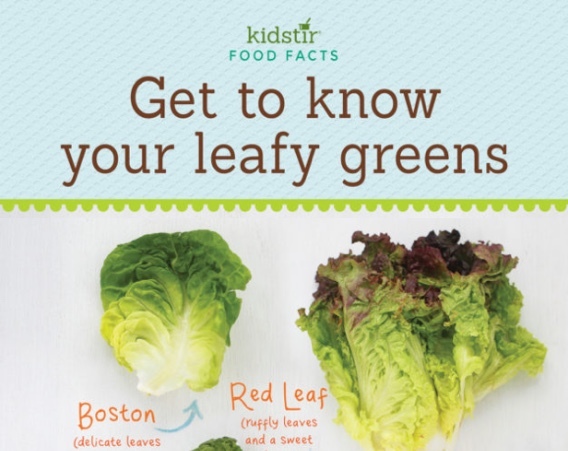 We’d love to offer the Kids Leafy Green Veggies Infographic for you to share on your blog. Just select and copy the code snippet below and paste into your next blog post. We’d love for everyone to share this page on social media or email using the buttons below so all the kids you know can learn how to pick out the best leafy green veggies!